From fireworks along the Thames, to river cruises and magical dinner dances, New Year in London is a spectacular occasion. Read on to discover our top six ways to bring in the New Year, and find out how to wake up to a glass of fizz on New Year’s Day. 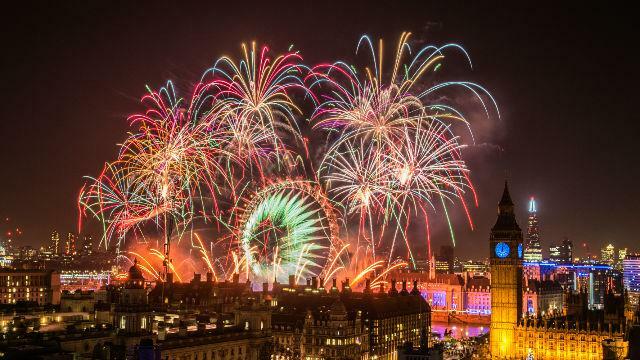 Bring in the New Year by watching the spectacular New Year’s Eve Fireworks over the Thames. The event is now ticketed, and at £10 a pop we reckon the event will sell out fast. Tickets will give you access to the best viewing platforms up and down the River Thames. You can sign up online to be notified of when the first batch go on sale. Attend the Natural History Museum’s first ever New Year’s Eve Ball. Hosted in collaboration with DJ Guilty Pleasures, you are promised a night of utter extravagance in one of the most fabulous venues in town. Party-goers will have a chance to explore the Dinosaur gallery, enjoy a spot of face painting and dance the night away. Ticket prices vary, and can include a delicious three-course meal and a VIP reception. Sail into 2017 on the Bateaux London Classic Dinner Cruise. Enjoy a fabulous four-course meal whilst taking in the spectacular views along the River Thames, all from the comfort of the elegant and sophisticated Symphony river boat. After dinner dancing and entertainment see you well into the New Year. Now in its 31st year, more than 8,500 performers will take to the streets for a spectacular outdoor parade. Musicians, dancers, acrobats, floats and clowns march and sing their way along the 2.2mile route beginning at the Ritz Hotel, taking in Piccadilly Circus, Lower Regent Street, Pall Mall, Trafalgar Square, Whitehall and Big Ben. Billed as ‘the ultimate New Year’s event’ last year, the London Sky Bar returns for 2016. Hosted at the top of Millbank Tower, the venue has spectacular 360 degree views on London. Ticket prices vary, starting at £250 per person. All include a complimentary cocktail on arrival, food on the night and a glass of Champagne to toast the New Year. Finally, no matter what you’re doing, you’ll want to make sure you’ve got somewhere to rest your head at the end of the night. Each of our three London hotels are located in the heart of the city. Our cocktail menus make them the perfect pre & post party stop. Book our New Year Breaks offer and you will enjoy a continental Champagne breakfast on New Year’s Day, plus a £10 voucher to spend in the hotel, only when you book direct. Is there a better way to start 2017?